Kamehameha Schools teacher Gail Woliver, right, is among the contributors to "Chicken Soup From the Soul of Hawai'i." She and her students encouraged each other to write. There have been 68 "Chicken Soup" books published in the last 12 years under a variety of diverse subjects as in "Chicken Soup for the ... Christian Soul," "Dog & Cat Lover's Soul," "Teenage Soul," "Golfers Soul," "Writers Soul," "Dental Soul," "Soup Soul," "Singles Soul," "Sports Fan Soul," "Jewish Soul," "Nurses Soul," "Veterans Soul," "Prisoners Soul," "Romantic Soul," and "Grievers Soul." 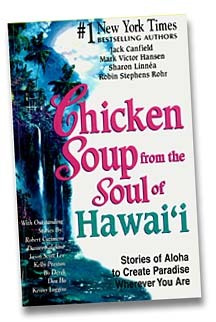 Now Hawaii has been added to the collection by entrepreneurs Jack Canfield and Mark Victor Hansen in "Chicken Soup from the Soul of Hawaii: Stories of Aloha to Create Paradise Wherever You Are," also edited by Sharon Linnea and Robin Stephens Rohr. The Hawaii "Soul" is a collection of short stories designed to convey "the magic of Hawaii and to understand why the whole world calls it paradise." The stories are written by Hawaiian elders, native storytellers like Nalani Olds, and activist and teacher Kanalu Young, journalists including the Star-Bulletin's Burl Burlingame and Charles Memminger, and celebrities who live here or are frequent island visitors: Bo Derek, Clint and Dina Eastwood, Don and Hoku Ho, Regis and Joy Philbin and Kelly Preston, along with world-class surfers, hula masters and master chefs. Canfield and Hansen are motivational speakers who, in 1990, started the "Chicken Soup for the Soul" phenomenon. The "Chicken Soup" concept was rejected more than 30 times before Peter Vegso, president of Health Communications, Inc., agreed to publish it. By September 1994, "Chicken Soup for the Soul" made the bestseller lists of The New York Times, Washington Post, and Publishers Weekly. The series has sold more than 50 million copies with translations in more than 30 languages. Actor Kelly Preston, who was born and raised in Hawaii, took a unique approach to her Hawaiian tale. She expanded a letter of love and appreciation to her parents Linda Carlson and Peter Palziz, thanking them for their patience and love, by emphasizing her good fortune in being raised in Hawaii. Her story is titled "Island Girl." "I wrote the letter soon after giving birth to Ella," said Preston, who is married to actor John Travolta. "Being the mother of two children, I'd been thinking back to my own wonderful childhood and all of the amazing experiences I had. Lots of the lessons I learned back then make me smile; but it's the conclusion that I wanted to share with them. "I thought expanding my letter would be perfect because it really is how I feel about Hawaii." Preston recalls fond memories like "piling into the back of Auntie Kathy and Uncle Joe's pick-up truck" and heading to Jackass Ginger, which she calls "a paradise for a little girl." "We'd arrive at the storybook setting of ponds and waterfalls, and best of all, a whole mountain filled with enormous mudslides! Then came the very important job of finding just the right ti leaves to fit underneath all of our backsides. "...we'd head up through the glorious tropical growth to the top of the long-worn paths, grasp the stalks of the ti leaves firmly in front, position our okoles (backsides) carefully and whoosh! the ancient Hawaiian luge! I'll never forget the sheer joy of riding those ti leaves down those well-worn grooves, hitting the twists and turns at what seemed hundreds of miles an hour, arriving at the bottom grinning and covered head to foot with mud and finally, splashing under the waterfall to get the top layer off, then running back to do it all over again." Preston says she still has a strong emotional connection to Hawaii, although she is only able to return at most twice a year. "Part of my heart is always there and I wanted to let my parents know how Hawaii still affects me," she said. "I still feel so deeply connected to it that whenever I arrive its an instant ahhhhh." Preston, in "Island Girl," joyfully recalls catching crawfish in the ponds in Nuuanu -- "though we always threw them back!" -- and how much fun she and brother Chris had diving for puka shells at Ehukai Beach. "Mom, I'll never forget you baking the greatest lemon meringue pies, and oxtail stew and shoyu chicken, and Dad for helping us build a tree fort in the banyan tree in front of our house." Preston hopes her story conveys the spirituality of Hawaii and the concept of ohana. "When I was rewriting my letter I found great joy in remembering my life, and life with my parents was so wonderful, but there was also sadness because I'm not there." Despite her and John's busy careers, Preston says Hawaii taught her "not to stress over little things." "There's a feeling in Hawaii that is very laid-back but at the same time people have a healthy perspective on what's important in life, like family," she said. "Ohana means family and we sure had one of the best. All those Sunday picnics in Kapiolani Park with Jimmy, Steph, Chula, Bob, and all of the cousins. And who could forget holidays at Uncle Sen's and Auntie Maudie's castle on Maui, a real live castle with turrets and a spiral staircase and a library wall of books that would really turn around if you took out the right book! And a dungeon filled with toys and a pool table. The Easter egg hunts there were great, but nothing beat their house at Halloween, when all the grown-ups would wear dark capes and hide in the darkened castle, and Chris and I would have to make it, running, from one end to the other, screaming and successfully surviving who knew what scary snares along the way!" "Hawaii taught me that there is beauty all over the world," Preston said. "You just have to be able to see it." Preston's trips to Hawaii are filled with family visits and celebrations which John also embraces. "Now that I've grown, I'm so glad that my own family feels so at home in the islands. I knew they would from the moment I brought my new fiancé home. Our whole family came over to the house to meet Johnny for the first time. . . aunties, uncles, cousins, and of course Nani. When Nani told Johnny what a wonderful dancer he was, he swept her off her feet, held her in his arms, and led her through a waltz. She was beaming and so was he. Nani even uncharacteristically allowed me to take her picture ... it's something I treasure to this day. "I guess what I want to say is that our family, and these islands, mean so much to us that we want to come back as often as we can. The reason for all of this, I realized, is that you are the best parents ever. You raised Chris and me with unlimited love, guidance, and fun. When Johnny or Jett tell me I'm a wonderful mom, I know it's because of the two of you. Mahalo nui ... there aren't enough words to tell you thanks. I love you with all my heart." Hansen hopes his latest "Chicken Soup" will help people create a paradise where ever they are. "Our goal is to change the world one story at a time," he said. "My dream is that one of these books will be in every house and in Hawaii." A portion of the proceeds from sales of the Hawaii book will go to The Waianae Coast Comprehensive Health Center Literacy Initiative and Hawaiian Civic Clubs "Kupuna Project" that documents the memories of 103 island elders on DVD.